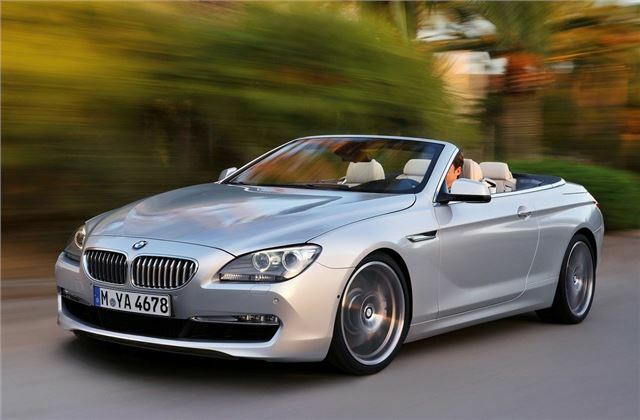 BMW has revealed details of its new 6 Series Convertible, which is set to arrive in March 2011. The latest version of the two-door grand tourer features an even more contoured roof along with a sweeping bonnet and the trademark 'Hofmeister kink' design at the rear pillar. It will be available as a 650i and a 640i plus a diesel - likely to be the 635d. There are even rumours of a more powerful 640d version. The new design has all the familiar BMW cues including chrome elements, such as the fog lamps consisting of a string of three LED units plus standard xenon headlights with the BMW double corona look. At the rear, two-part rear light clusters give the L-shape lights a distinctive appearance while inside the units, two LED-powered light strips create a striking night-time look. The rear indicators and brake lights are also LED units. One of the major talking points of the BMW 6 Series Convertible is its roof. The multi-layer roof - which has been optimised in terms of its acoustic properties, thermal insulation and structural rigidity - has fins projecting out along the flanks of into the rear section, giving it a smooth, coupe-like appearance. It also means that the upright, heated, glass rear window positioned behind the rear seats can be lowered separately from the roof. The roof is opened and closed via a button on the centre console while the Comfort Access option allows the roof to be operated using the remote control button on the key. Opening the roof takes 19 seconds, with closing taking 24 seconds. Both operations can be activated while on the move at speeds of up to 25mph. The fin roof of the new BMW 6 Series Convertible is available in three colours, including a new Anthracite Silver effect. Despite its lower height, the 6 Series Convertible offers greater headroom in both the front and the rear, and height adjustment of the driver and front passenger seats now cover a greater range too. The cabin has been designed to be driver-focused yet comfortable and enveloping for passengers. All the main functions including the central section of the instrument panel, containing the iDrive system's Control Display, the central air vents and the controls for the audio system and air conditioning, are all angled slightly towards the driver. The new BMW 6 Series Convertible is also fitted with newly developed lightweight seats with an integrated seatbelt system and an Easy Entry function to the rear passenger compartment: a brief tap of a switch automatically moves the seat as far forward as possible. Sports seats and, for the first time, comfort seats can be fitted as an option too. Both the standard Dakota leather and optional Exclusive Nappa leather come with BMW's exclusive SunReflective Technology: a special treatment of the leather integrates colour pigments which reflect the infrared rays of sunlight, significantly reducing the build-up of heat on the surfaces when the car is parked with the top down. The new BMW 6 Series Convertible is available from launch with two petrol engines: the 650i and 640i. The 4.4-litre eight-cylinder engine in the new BMW 650i Convertible is unique in that the two turbochargers are positioned in the V-shaped area between the cylinder banks. This design results in more efficient packaging and greater engine efficiency. A maximum 407bhp is developed between 5500 and 6400rpm, with peak torque of 600Nm available between 1750 and 4500rpm. The BMW 650i Convertible sprints from zero to 62mph in 5.0 seconds, with a top speed electronically limited to 155mph. Efficiency is impressive for such a powerful car, with claimed average combined fuel consumption of 26.4mpg and CO2 emissions of 249g/km. The six-cylinder in-line engine in the new BMW 640i Convertible uses single turbocharger technology alongside petrol direct injection with VALVETRONIC fully variable valve control. This enables the 3.0-litre unit to develop a maximum 320bhp and maximum torque of 450Nm between 1300 and 4500rpm. This engine propels the BMW 640i Convertible from 0 to 62mph in 5.7 seconds and on to an electronically limited top speed of 155 mph. In terms of efficiency it achieves a claimed 35.8mpg on the combined cycle, while CO2 emissions are only 185g/km. This is aided by an automatic transmission that features Auto Start-Stop technology and an automatic active air flap control behind the car's kidney grille for optimum engine performance. As with all BMWs, both derivatives of the new 6 Series Convertible come with a raft of BMW EfficientDynamics measures to reduce fuel consumption and emissions. In addition to the features highlighted on the 640i Convertible, both models have technology such as Brake Energy Regeneration, Electric Power Steering (EPS) and intelligent lightweight construction. An eight-speed Sport automatic gearbox is standard on both models. The new BMW 6 Series Convertible comes as standard with Drive Dynamic Control, which allows drivers to choose how responsive they want the gearbox, steering and throttle to be, while the Adaptive Drive system is available as an option with electrically controlled dampers and anti-roll stabilisation. Another unique feature is the optional Integral Active Steering system. This system combines Active Steering for the front axle with a steering rear axle, allowing the steering angle and power assistance to be controlled at both the front and the rear with the help of electric motors.